What do you do after returning to your workbench with a product that has just failed radiated emissions? In this multi-part series, I’ll describe simple and low-cost ways I use to help my own clients solve these issues. Most of the time, it’s possible to set up a simple 1 to 3 meter “measurement range” and determine whether a potential fix is required, or not. First, a little troubleshooting philosophy. In many cases, you’ll run into more than one emission source causing the same harmonic frequency. The result is that you might apply a fix and the harmonic will do three things – either get reduced, have no change or better yet…get larger! It won’t be until you apply fixes to ALL the sources that you’ll yield positive results. This is what makes chasing down emission problems such a joy(! ), I mean “challenge”! There is also the issue of “balloon effect”; that is, you’ll beat down one frequency, only to have one, or more, pop up higher! It’s like squeezing a balloon in the middle – both ends get bigger! Often times, this is the result of resonances within your cabling or on the PC board. In this installment, I’ll describe some simple reference antennas I use (you’ll be surprised) as well as setting up an area on your workbench where you can troubleshoot and apply potential fixes and really see whether you’re making progress, or not. The antenna you select should ideally be somewhere near resonance for the frequencies of concern, however, it’s not really that critical for troubleshooting purposes. So long as the antenna is fixed in length and fixed in place on the bench, you’ll receive consistent results. During troubleshooting, it’s more important to know whether the fix is “better” or “worse” or “no change” and as long as the test setup doesn’t change, the results should be believable. Low-cost EMC antennas I use for troubleshooting, based on television "rabbit ears" and a UHF folded dipole. 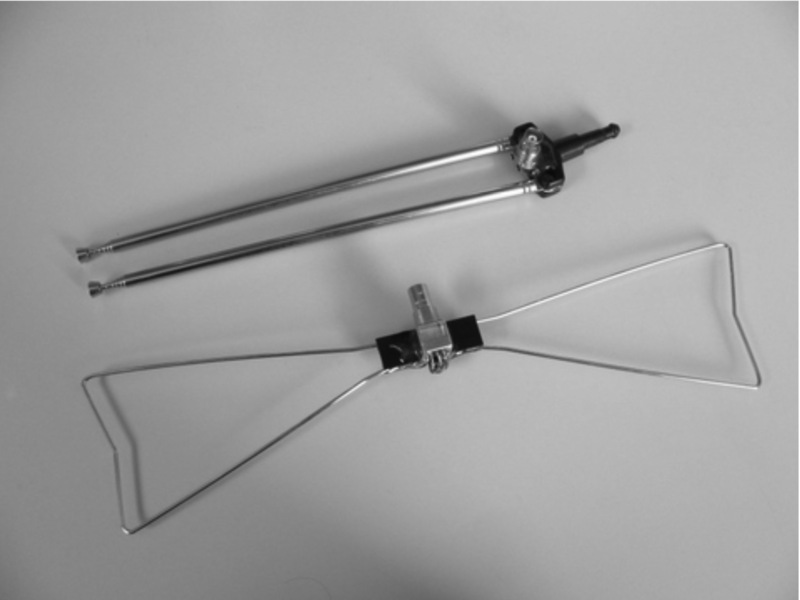 Now, EMC antennas are not inexpensive, as you might imagine, so for general troubleshooting, I tend to use a couple television antennas – a pair of “rabbit ears” and a UHF “bowtie” (with TV balun to match 50-ohm coax). If the workbench is wooden, I’ll extend the antenna to approximate resonance (if possible) and tape it down to the bench with duct tape. If the bench is metallic, I’ll find a non-conductive support and position it some distance away from (or above) the bench. I usually use a test distance of about a meter, but as long as you can see the product’s harmonics on a spectrum analyzer, you’ll be able to determine your progress. Sometimes I need to insert a low-noise wide-band preamp between antenna and analyzer. Now, obviously, ambient signals from broadcast radio, television mobile phones and two-way radio services will tend to interfere with observing the product harmonics. You may need to bring the antenna closer or set up the troubleshooting measurement in a basement or building interior away from outside windows. I usually record the known harmonics of concern and try to characterize them in relation to other nearby ambients. If I know that one, or more, cables are the dominant radiation source, I might use a current probe to monitor the common-mode currents flowing on the cable, rather than an antenna. This also helps reduce the ambient signals, because current probes are generally shielded against e-fields and tend to be poor antennas. I’ll attach the probe to the cable with dominant emissions, moving it back and forth along the cable to achieve a maximum, and then fix it in place. Commercial current probes can measure rf currents flowing on I/O cables - a very typical issue for radiated emissions issues. Next, I’ll clear off the workbench and (assuming the product is small) find a convenient place for it where I can work on it without moving it around much. I also place reference marks on the bench with tape, so I can reposition it for repeatable measurements. At that point, I’m ready to begin the troubleshooting and fixes while watching the emission levels. Now don’t make the mistake of assuming that a 10 dB reduction on the bench with a one-meter test distance translates to the same reduction when measured at the test facility at a ten-meter test distance! During troubleshooting, we’re likely working in the “near field” where test distance is determined by terms of 1/r squared and 1/r cubed. At ten meters, we’re likely in the “far field” (plane waves) and the distance factor is closer to 1/r. Where “r” is the test distance. You can be fairly confident, though, that a reduction on the bench will equate to some reduction at the site. More in the next posting! 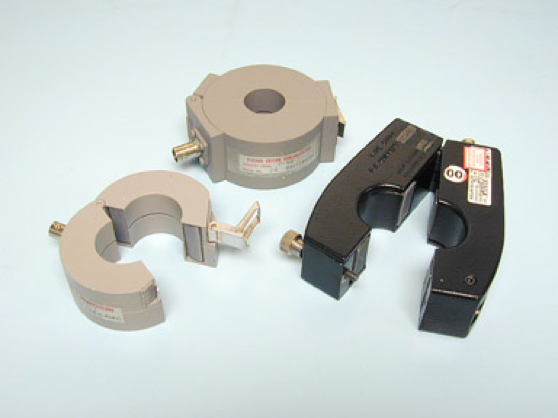 This entry was posted in Troubleshooting and tagged antennas, current probes, troubleshooting. Bookmark the permalink. Good idea Dave. There are a couple easy formulas to remember. In free space, the wavelength (in meters) is 300/Frequency (in MHz). So 300 MHz is a 1-meter wavelength. This is also why most (typically 1-meter) I/O cables seem to radiate especially well around 300 MHz. If you’re more comfortable using feet, a half-wavelength (in feet) is 468/Frequency (in MHz).